lt;stronggt;FEL00702lt;/stronggt;lt;BR/gt;Bankers Box Stor/File Storage Boxlt;BR/gt;Double end, 1 1/2 side, double bottom construction. Medium duty for use with or without shelving. FastFold quick and easy assembly. Deep locking lift-off lid stays in place for secure file storage. Rolled edges add strength and prevent paper cuts. 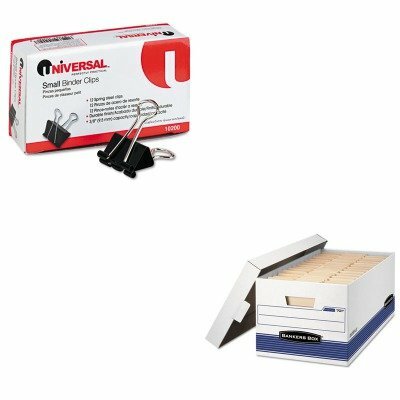 Stock up and save Box Type: FastFold Materials: 1 Ply Side2 Ply Bottom2 Ply End Strength: Medium-Duty.lt;BR/gt;lt;BR/gt;lt;stronggt;UNV10200lt;/stronggt;lt;BR/gt;Bankers Box Stor/File Storage Boxlt;BR/gt;Ultra-efficient binder clips feature handles that can be hung, folded flat against clipped material or removed for permanent binding. Efficient triangular design provides optimum strength and compression. Clip/Clamp Type: Binder Clips Colors: BlackSilver Materials: Plastic ClipSteel Wire.